Once upon a time, when you used exact match, you knew exactly what search terms would trigger your ads. Then Google made a slight change that made it so your exact match terms could show for plurals, misspellings, and different word endings. Then Google made a change in 2017 that allowed for your exact match word to show for different search term orders and new words could even be added or removed from the search term and your exact match keyword could still be matched and display an ad. In 2018, Google made one of the most aggressive changes to exact match ever – exact match keywords are matching to what Google deems to be the same meaning regardless of the words being used. This is a very controversial change and the results have been highly mixed. Some people have seen these changes do OK for them and the changes haven’t been an absolute nightmare to manage. These accounts should feel blessed as they don’t have to do a lot of diagnostic and organizational work to fix the all the problems that have been arising. Then there’s the bad matches. Google is managing semantics at scale and does not understand individual users and why subtle variations of search terms can cause massive changes to the intent of the search and thus, CTR and conversion rate problems for advertisers. When it’s good there’s not much to do but enjoy the additional volume. When it’s bad you have a lot of work to do. When it’s bad – it’s usually stems from only a few base scenarios, which you can easily learn and identify, so that you can fix these problems going forward. Let’s start by looking at why Google gets it wrong in the first place. 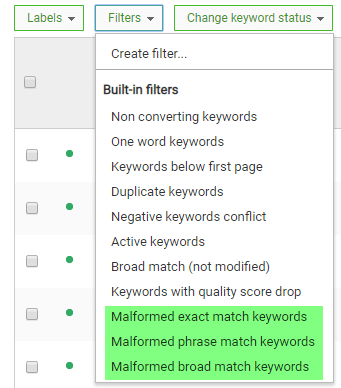 This is the most common issue with the new match types; a user has something specific in mind, searches, and Google matches to your exact match keyword with a completely different intent. Unfortunately, this happens a lot with the new system. When someone is searching for Yosemite camping they need to know about bears, how to protect food from bears, where you are allowed to camp and not camp, what areas are off limits, what the leave no trace policies are and so forth. Finding a campground is a very minor subset of this intent. For those who are advertising for publishers, who are showing ads on how to properly camp even Google’s example brought up issues where they needed to reshape their accounts. Another common issue is when the same words are used in a different order and that completely affects the meaning of the word. The exact match keyword [Forms of Trademark] which is someone looking for the types of trademarks and might contact an attorney or online system to help them (hence, it is a commercial query), now matches to the search term “Trademark Forms” which is conducted by someone who wants to do it themselves and just needs the forms – not a lawyer. One version of this word ends up in customers for a lawyer. The other version ends up in a waste of money. PPC Ads, Pay Per Click Ads, AdWords Ads may be searched by someone who just wants information on PPC in general or who has specific questions about the ad portion of their account. Google now considers ‘Pay Per Click Ads’ and ‘PPC’ to be the same thing. As we’re advertisers at Adalysis, we’re willing to bid on the terms that include ads, but not on the terms that do not include ads as there’s a huge conversion rate and volume difference between the two. Google is completely dropping the word ‘tickets’ in matching for 2 to 1. The intent of the word ‘tickets’ usually refers to an event or attraction that you need to buy a ticket to attend. Atlanta 2 for 1 could be a ticket or just a place that has 2 for 1 dinner specials, which does not require a user to purchase a ticket. Solution: Those who sell tickets need to add the exact match terms ‘city name 2 for 1’ (without tickets) to every ad group with these types of keywords, and then often repeat it for event names and other combinations. Deals, bundles, packages, discounts, and sale all seem to mean the same thing these days – depending on the account. In some accounts, we see Google interchanging the words deals and packages, in other accounts they are not – this inconsistently is really annoying. However, if we break this out, that’s not how an advertiser typically sees this. Package & Bundles: Selling two or more items together as a grouping. Sometime a discount is offered and other times it’s just bundled together as it is common for someone to buy both items at the same time. Deals, Discounts, & Sales: Items sold at a discount. If your keyword is Rim & Tire packages, be prepared for your exact match terms to match to rim & tire deals and potentially to sales, discounts, or more. This also gets into our next issue for when you have both keywords in the account, Google doesn’t always honor it and may trigger a different ad group to show even when you have a very close match of that search term in the account already. Solution: Many ad group negative keywords which can get into negative keyword limits or restructure the account where each type is a different campaign to just use campaign negative lists to manage the poor queries. Google ‘tries’ to honor the fact that if you have the exact match term in one ad group to show that ad group when the search terms is exactly the same and we mean exactly the same. The issue comes with the new matching where there’s a lot of subtle variations that can trigger the wrong ad group. At this point in time, Google can show any ad group for that term as it’s not the actual exact match word that is being triggered, so they can choose any of those ad groups that are ‘close enough’ to the search term. As they often treat these words the same (especially packages and deals), Google essentially can pick any ad group to show as you don’t have the actual search term as a keyword in the account you just have the exact match term that’s the same as the ad group. This is by far one of the biggest issues these days. If you add all the keyword variations, you feel you’re adding a lot of extra words (like we had to 10 years ago when we’d add every permutation, misspelling, etc to an ad group) and Google will tell you they are the same. If you don’t add them, then the wrong ad group often shows causing potential problems with CTRs and conversion rates. As Google considers hire and rental to be the same thing, as soon as the search term is a close variant and not the actual keyword, Google can trigger either the rental or the hire ad group for a city search. When the one that shows an ad is opposite of what the user searched (for instance, hire was searched, and rental was displayed in the ad) the conversion rate plummets. In a case like this, you need a lot of negatives. For example: When the close variant contains hire and the keyword contains hire, the conversion rate is 6.41% with a $12.84 CPA. Solution: Most of these companies have too many ad groups to use ad group negative keywords to manage these issue (there are negative keyword limits) so, they are evaluating going to a different structure. When you have millions of keywords, this is a lengthy proposition. While some of these limits seem generous, if you have a campaign with 3000 ad groups and based upon needing to add misspellings, incorrect matches, etc to each ad group – you need to add 5 negatives to each ad group (which is actually a small number with these new variations) that would be 15,000 negative keywords in the campaign. That’s more than the allowed limit, so that isn’t actually a solution you can utilize. Negative keyword lists allow you to create a list of negative keywords and apply that list to one or more campaigns. As you adjust the list, this automatically updates the negative keywords used in that campaign. If you can use this option, it’s your best bet as it is the easiest to maintain. Unfortunately, if you have ad groups that are packages, deals, sales, bundles, etc – that means you first need to reorganize the account to use the negative lists. If there are just a handful of problems you are running into, and you are fairly well segmented now, consider this approach as it’s by far the easiest to scale. If your problems are only occurring in a few ad groups and not across the entire account then adding ad group negative keywords is your solution. This is not a scalable solution due to negative keyword limits but if you only have some problems here and there it is an easy solution. If Google just won’t honor the intent of your words you can always abandon exact match and move to phrase match. We’ve seen a few companies employ this strategy with the changes to match types. The biggest issues they are running into, if they do this in mass, is accidentally moving some single word exact match words to phrase match and seeing their impressions increase dramatically. If you are going to switch to phrase match, first do it for your 3+ word keywords as they are generally already fairly specific. Then take a close look at your 1 and 2 word keywords to see if switching is going to help or hurt you with the additional volume. In some cases, advertisers are making campaigns only for the 2 word keywords to employ a lot of negatives the 3+ word combinations don’t need and then often leaving the 1 word keywords (when used, which isn’t always) as exact match. There are times the negative keyword limits hinder one of the other options. You might want to use negative keyword lists to manage these changes but you can’t as you just don’t have the proper organization for it. In that case, you may need to reorganize the account before you can utilize a negative keyword strategy. Before taking on this challenge, don’t just look at how often Google is getting it wrong for you – also look at the impression and cost numbers. While maintaining a strict level of control might seem ideal, if it’s for 0.05% of your spend, it might not be worth the huge level of effort in a massive account. Just to clarify Google’s terminology in the Search Terms interface. If the term is ‘exact match’, it is your actual exact match keyword. 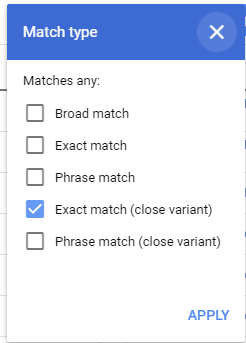 If the term is ‘Exact match (close variant)’, the search term matched your exact match keyword, but it is not your exact match keyword, it is a variation, which can range from misspellings to completely different words. First and foremost, you should be watching your close variant search terms. In the interface, you can filter for only the exact match close variants. Then you can look to see if there are egregious errors that you need to fix. When the same search term is shown from multiple ad groups, you don’t know what ad, landing page, or even bid is being used across your account for that search term. Finding areas where Google is showing multiple ad groups for the same search term allows you to quickly find places where you want to take back control over your account. This can be done with scripts or 3rd party tools like Adalysis that have tools for managing duplicate search terms. For example, in this account there is a search term that when it shows from ad group 1, the conversion rate is 24%, when it is displayed from ad group 2, the conversion rate drops to 18.86%. Ensuring that search term only shows from ad group 1 will help the overall conversions for the account. When you are running into negative keyword limits, it’s good to consolidate negative keywords when possible. For instance, if you have the same negative keyword in every ad group in a campaign and that campaign has 1000 ad groups, with the click of a button you can go from 1000 negative keywords to just 1 by moving all of those negative keywords to the campaign level. While there are a lot of issues with the new match types, they are performing for some accounts. We will see some accounts where the close variants are doing as well, or even better, than the standard keywords. These examples don’t exist that often. There are many more accounts where the variants are within 10% CPAs of the actual keywords (usually within 10% higher CPAs – not lower) and are providing additional conversions. It’s when the variants are dragging down your performance in a campaign, or the entire account, that you really need to think through how you are going to manage the variants, negative keywords, and your overall organization. If you are monitoring this data and you don’t have any issues, congratulations, you have a lot less work to do than others and can spend your time doing some fun testing. If you do have problems, that’s when you need to think through your negative keyword usage and organization to ensure that you have control over your own account. By taking the steps outlined in this article, you should be able to maintain control over your account without huge amount of efforts, so you can continue to test and optimize other areas of your Google Ads account. If you have [car hire] and [car rental] in separate adgroups, wouldn’t they bid against each other now? I foresee very hard to manage negative lists. Very disappointing update for the advertiser, but I guess there is nothing we can do about it. They will bid against each other if there’s a slight variation in the search term from the keyword. That’s why the negatives are crucial in situations like this where CTR and conversion rates are drastically different for two different keywords/ads that can match to the same query.